KARACHI: Sindh cabinet finally approved the controversial Sindh Universities and Institutes Law (Amendment) Bill, 2018 here on Monday which brought governor’s exercise of power on varsities to an end. The amended bill effectively transfers the powers previously by the governor to the chief minister. It is recalled here that Governor Sindh Mohammad the Zubair, a few days ago, had returned Sindh Universities and Institutes Laws (Amendment) Bill 2018 on the grounds that it does not conform to the law governing the other three provinces. The cabinet meeting was held under the chairmanship of Sindh Chief Minister Murad Ali Shah at New Sindh Secretariat which also approved new External Debt Management Manual (EDMM) and Sindh Katchi Abadi Authority (SKAA) budget. It also expressed serious reservations against growing load shedding and federal government reluctance to name new Islamabad International Airport after the name of Shaheed Benazir Bhutto. The chief minister, who also holds the portfolio of finance, said the objective of EDDM is to describe the policies and procedures governing External Debt Management for the Sindh government. It should be used for day-to-day management of external debt activities. “Where appropriate, diagrams and flow charts are used to facilitate users’ understanding of the process and workflow,” he said while adding that this document is prepared to meet all basic requirements and to attain the desired internal controls over external debt management policies at the provincial level. The manual explains activities relating to external debt management, the need for controls, the nature and content of the work processes and importance of aspects such as debt recording, servicing and reporting. The cabinet approved the manual. The cabinet also approved a budget of Rs555 million for 2017-18 for SKAA which includes Rs200 million in government grants and the Rs355 million to be generated from SKAA’s own resources. In the budget 22 posts of grade BPS-1 to grade BPS-20 have been created and Rs45 million have been allocated low housing scheme. To a question about expenditures, the chief minister was told that Rs325 million would be spent on salaries, Rs109 million would be non-development expenditures and Rs121 million on development expenditures. There are 1409 katchi abadis in Sindh of which 1251 have been regularised. Senior Minister Nisar Khuhro pointed out that an old katchi abadi in was inaugurated by Shaheed Bhutto has not been regularised so far. On this, the chief minister directed Katchi Abadies Minister Murtaza Baloch to personally visit the scheme and regularise it at the earliest. The cabinet also took up the Sindh Universities and Institutes Law (Amendment) Bill 2018 passed by Sindh Assembly and referred back by Sindh Governor for reconsideration. The cabinet expressed reservations on the language the governor had used in his observations for referring it back to Sindh assembly. It was pointed out that the conduct of the governor cannot be discussed in the assembly. Since the chief minister is elected representative and is answerable to the assembly, therefore he has been given the powers of appointing vice-chancellor through a search committee and a proper procedure has been worked out in the draft law to remove a vice chancellor in case of serious allegations proved through an inquiry committee. The cabinet approved the draft and referred it back to the Sindh assembly for reconsideration and also added some other recommendations while directed Law Department to look into the draft before sending it to the assembly for reconsideration. The cabinet was told that the Prosecutor General Shahadat Awan has resigned due to his personal reasons, therefore the post cannot be left vacant for long. The cabinet approved the appointment of Dr Fiaz ul Hassan Shah as new Prosecutor General and directed the chief secretary to issue his notification. The cabinet on the recommendation of the Labour Department discussed some proposed amendments in the Sindh Employees Social Security (Amendment) Bill, 2018, The Sindh Workers Welfare Fund (Amendment) Bill 2018, Sindh Employees Old-Age Benefit (Amendment) Bill 2018 and Sindh Minimum Wage (Amendment) Bill 2018. The cabinet was told that the amendments were proposed on the recommendations of the first Sindh Labour Tripartite Conference held on December 11, 2017. 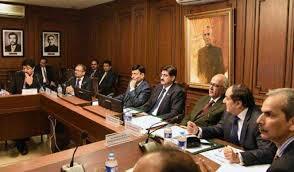 The cabinet also expressed concerned that the federal government has started prolonged load-shedding all over Sindh. The cabinet urged the federal government to have mercy on the people of Sindh and stop load shedding in this sweltering weather. The CM directed local government department to expedite ongoing development schemes launched under Karachi Package and complete them by May 15. He said he had visited the Submarine Chowrangi Underpass and Sunset Boulevard Flyover in his personal vehicle without any guard. He added that the work on submarine Chowrangi was in full swing while the work on Sunset Boulevard flyover was slow. He expressed his displeasure and directed Planning and Development head Niaz Soomro to accelerate the work while ensuring the quality. The chief minister also said that he would open Tipu Sultan Road from Shahrah-e-Faisal to Karsaz on April 25, 2018. “I have personally visited this scheme and it has been completed by 85 percent,” he said and Soomro to personally monitor it so that it could be completed by the stipulated date.